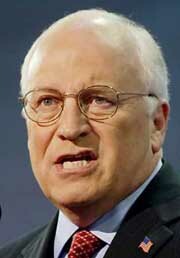 &quot;If Cheney had shot Dan Quayle, America would be cheering. But since Cheney just shot a lawyer, why isn&#39;t America cheering?&quot; padadatttting Here all week...tips go in the jar...thank you thank you veruh muuhch. &quot;If Dan Quayle had been quail hunting and had shot his hunting buddy, the only thing America would be demanding is where to sign up as _his_ hunting partner. They sure wouldnt&#39; give a damn about the condion of the lawyer who was shot.&quot; padadatttting Here all week...tips go in the jar...thank you thank you veruh muuhch. Cheney&#39;s favorite saying: A round in a Quayle is worth two in a Bush? I AM the funny one! FUNNY! FUNNY! FUNNY! and the winner is... kmt thank you all for playing.